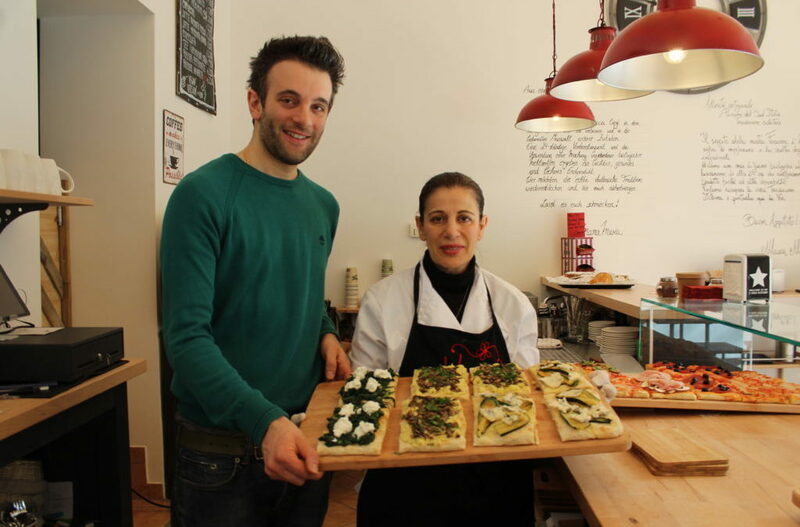 What happens when a mother joins her son to open a pizzeria in one the most popular neighborhoods in Berlin? “Berlin? When there was the Wall, this city used to give me a feeling of real terror. I know that the guards were ready to shoot whoever tried to escape during the Cold War and you could still hear the echo of bombings of World War II. It did not seem like a good place to live in at that time, but now here I am, a happy 60-year-old woman living in a place I could have never imagined to stay at that time“. Her name is Maria, born in 1957 and until 2017 she had never moved out of her 2.000-inhabitants native town, Taverna, located at the base of the Sila mountain, about 25 kilometers from Catanzaro. Her son Francesco named “Mama Maria’s” pizzeria after her. It opened in November 2017 in Frankfurter Allee, the boulevard where the DDR regime used to parade, but today it is one of the most popular areas in Berlin. “The name recalls the soul food concept, that is to say homemade and affordable food”. Francesco was born in 1981 and his story is as interesting as that of his mother Maria. “I moved to Berlin in 2010. I graduated in Economics at the University of Siena and I have worked for many years as a broker and Berlin was one of the cities where I had lived and enjoyed the most. Here, I have understood that working in an office did not motivate me – it was time to follow my dream: cooking. So, after my mother said she would move to Berlin and realise my dream together, I finally started arranging Mama Maria’s opening”. He then had to totally change his habits. “But not as much as one could imagine. I passed from finance to cookery, but especially from a large asset management to the management of a small enterprise”. However, Francesco did not settle for his mother’s help. His brother-in-law and his sister, Viviana, moved to the capital city as well. “She graduated in Law but she has always been an artist. The mural is indeed an artwork of hers. She got inspired by the famous photo “Lunch on a skyscraper”, which is painted on one of the walls inside the pizzeria. It took two months to complete it and, after that, she decided to stay to help us running the business”. Mama Maria’s dishes are all homemade: “Pasta, soups, minestrone, potato gateau – also known as “schiuma” in Calabria – as well as lasagne and cakes. I grill aubergines and courgettes for pizza, I cook porcini mushrooms and spinach all by myself. We have presented our business as a pizzeria to-go and our most popular pizzas are with potato and mushrooms topping or ricotta cheese with spinach, as well as artichoke and mozzarella, but the menu is actually wider and it also has daily specials. Our goal is to offer our clients those homemade dishes that one could find in the south of Italy. All the ingredients we use come from Italy: for instance, “soppressata” – a dry-cured pork salami – and salami are produced by my brother in Calabria. Ours is a butcher family since decades, that’s the origin of our passion for food”. At the moment Mama Maria’s is open from Monday to Friday, from 8:45 am to 7:30 pm and on Saturday from 11:00 am to 7:30 pm. “We actually keep on working until late because we want our pizza dough to rise at least 36 hours, that is to say that while the pizzeria seems to be closed, we are preparing our pizza dough, which will be served in two days from that time. It is a constant work, but I am very proud of it. I feel moved when I hear German or foreign clients saying “thanks Mama Maria”. I am only concerned about the fact that I still have not had spare time to learn German and have basic conversations. I hope that after the initial effort I will have more time to make new friends and to get to know the city better”. How is it to live far away from the little town you were born and raised in? “Due to his job, my husband has to stay in Calabria, even though he tries to come here in Berlin as much as possible, but unfortunately transportation is not that efficient. As soon as he retires he will move here too, but meanwhile I enjoy this change, even if it’s quite a big one. I’ve always dreamt of living in a city, although I would have never expected to move abroad or even in Berlin. But, surprisingly, here it feels like home”.